This article follows some really interesting mathematical research by Jason Brown that should interest EVERY (rock or otherwise) musician in the classroom (or beyond). 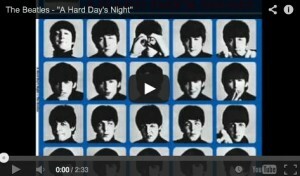 Yes, after a Hard Day’s Math the famous Beatles song has been unravelled to reveal the components that give the opening chord its unique sound! There is perhaps no song as quintessentially Beatle-ish as A Hard Day’s Night – it just bubbles with unbridled enthusiasm and joy. And in my mind, there’s no other opening chord of a rock song that is as instantly recognisable as that one. I grew up grudgingly playing the piano, practising only the half-hour before my lesson each week. But as soon as heard my first Beatles’ record, I dropped the piano to teach myself guitar eight hours a day during my high school summers. Over the ensuing years, I have applied mathematics in a variety of ways to analyse pop music. 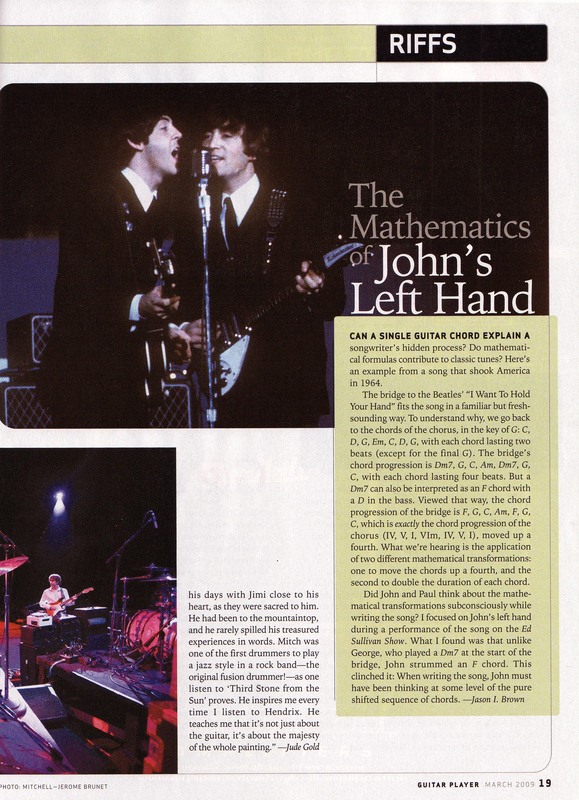 In a second article in Guitar Player magazine I deduced mathematically that George Harrison must have recorded his famous, brilliant solo in A Hard Day’s Night by slowing down the tape speed in half, and recording the solo at half-speed down the octave… Some musicians I’ve spoken with have been upset at the research, as perhaps it showed George’s technical skills were not what they should have been, but the truth I think says more – it showed George was a musician first, doing what it took to play what was in his head rather than in his fingers, and he had to have an incredible amount of confidence to choose to record a solo at half-speed, knowing that all of the world would be watching for when he played it up to speed, live (which, of course, he did!). I’ve also written about why the music to I Want To Hold Your Hand was so imaginative and clever that it brought America to its knees, and why Paul McCartney so correctly named Little Richard’s Long Tall Sally as perhaps one of the greatest rock songs ever (and more generally, a mathematical basis for why the blues chord progression is so damn good).” Read more from The Conversation here.